Today's Top Tech: Cisco Tries To Stick It To Apple With Full-Page Ad In NYT | OhGizmo! So, you know Apple is being sued by Cisco for using the iPhone name, right? Technically, Cisco’s got a case. They do own the name… in theory. But, then again, maybe not. And the full-page ad you see above is their latest move in this ongoing saga. Here’s the deal: Cisco’s owned the name since 2000, when they bought Netgear Infogear. But they haven’t used it in a product up until December 2006 (that’s, like, a few weeks ago, by the way), UPDATE: when they started shipping a VoIP device through Linksys, a company they apparently bought in 2003. Well, it turns out you can’t just sit on a name; you have to actively use it in the marketplace or risk losing it, and Cisco had simply not been using the name. That’s why there’s a decent chance Apple could win the lawsuit and be able to keep using iPhone, essentially giving Cisco the finger. Cisco obviously knows this, and they’re taking steps. As you can see in the above image, they took an expensive full-page ad in the NYT, touting their version of the iPhone, as if it was their most cherished product. 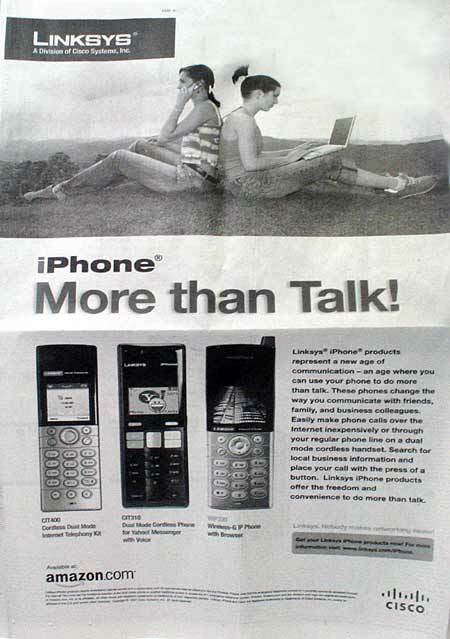 It’s a direct challenge to Apple, with the words “More than talk!” in bold; likely a reference to Steve Jobs saying the Apple’s iPhone was built around voice. So, why would they do this? Either to consolidate their claim on the name, or to confuse the marketplace in the hope of diluting Apple’s future benefit from the use of the name. If this is the beginning of a larger ad campaign from Cisco, you could end up with a situation where you have enough consumers confused about the iPhone (“Which one’s which, again?”), and where both products could suffer, though Apple stands to lose more from this than Cisco does. In a way, Cisco would be saying “If we can’t hold on to that name, we’re gonna do our damndest so the name becomes useless to you.” Is it too little too late? Time will tell, but once thing is sure: this ad is a clear message to Apple that Cisco has no intention of bending forward and grabbing ankles. Cisco doesn’t own Netgear, it owns Linksys. And it bought Linksys in 2003, not 2000. And iPhone was not acquired in that purchase. It was a purchase of a different company. That’s only the first half of the first paragraph. I stopped reading after that. This article was good until the lewd reference at the end, gimme a break. At this point, i-anything is embedded in the public consciousness as an Apple product. To me, any company using the i-prefix name for what very clearly is not an Apple product screams “knockoff.” It doesn’t matter if they actually own the name at this point–it just seems like coattail riding. What’s so great about the name iPhone that they’d put up such a fuss about retaining the name anyway? Unless they’re doing this specifically to ensure that Apple is forced to purchase the name for an appropriate price, let it go. That Linksys ad is awful-looking. If it didn’t say amazon.com on the bottom, I’d almost think it was a Radio Shack ad from 16 years ago.